With 27 vehicles of 14 different models showing up, this turned out to be a great event. We put a lot of effort into advertising to the public and that seems to have worked out great, as the event had much higher attendance than we were anticipating. We had six different cars doing test drives; the Model Ss were constantly out doing rides and the BMW i3 went on drives until its battery was depleted. At least three city council members visited. We are very excited to do an event again next year! 92% of electric vehicle owners won't go back to gas1. Want to know why? Come find out for yourself, at this fantastic event presented by the North Sound Electric Vehicle Association. There are over 12,000 electric vehicles in Washington2. Washington residents have access to buy a variety of EV models, incuding the Nissan LEAF, Kia Soul EV, Tesla Model S, Ford Focus Electric, BMW i3, and Mitsubishi i-MiEV. You will find all of these models at this event! Test drives and rides will be offered by owners of several electric cars! Experience the power of 100% torque from a stop, the silence of the motors, and the modern technology inside. Discover the benefits of electric vehicles, by talking to real EV owners from our area. Low cost of ownership, quiet driving, quick acceleration, outstanding reliability, and easy refueling are just a few of the things you'll hear about. Already drive an EV? We welcome you to attend this event and socialize with other EV owners! Please register using the button above. If you aren't from Bellingham, several charging options are available on the way to the event. 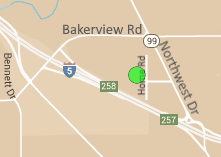 There are also hotels in Bellingham with charging options available if you wish to stay a little longer. We wish to thank Western Solar for offering to host this event in their parking lot, which is located off Northwest Ave and Bakerview Rd in Bellingham, behind Mt. Baker Imaging. Food will be available from The Rickshaw, providing delicious Asian fusion options! North Sound Electric Vehicle Association is a chapter of the Electric Auto Association. 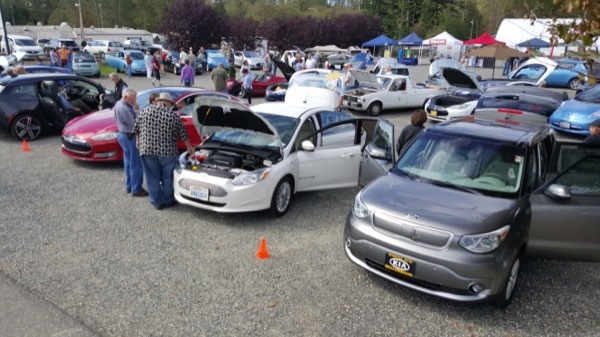 In addition to hosting events like this one, we advocate for EVs in northwest Washington by keeping the public, local businesses, and local governments informed about the benefits of electric vehicles and charging infrastructure. We hold monthly meetings in Bellingham. Learn more at our website, northsoundeva.org. Please use the Register button above to let us know if you'll be coming! You can also volunteer to help out and contact us with questions. Registered attendees report 533,381 electric miles driven.